My bloggy blues have more to do with Blogger. I've been perusing my buddies as usual this fine morning, even making comments. Thing is, when I hit "post comment" I get an error message. I've given up for now. Yesterday things in my Real World went quite wonky. Not sure how today's follow-ups will play out, but I probably won't be around very much this week. I have some scheduled posts for the blogfests that are linked on my sidebar, and that may well be all anyone hears from me for the week. We'll see; I can rarely keep my mouth shut that long, so one never knows. That happened to me this past weekend. It was crazy. Very frustrating. I went to the help emails and apparently a lot of others were getting it, too. I kept trying, took a lot of breaks, and eventually it all worked. My morning has gone like this as well. I keep trying, though. I hate thinking my peeps think I forgot them. As far as i can tell, blogger is giving that error to everyone this morning. On the plus side, most of my comments still posted after i got that error. Blogger went crazy for me last weekend. It's going around. Yeah, the comments are tweaking out on me too. I had a few of those blogger issues this weekend but I hit the back button and that seemed to resolve it. I hope things get better for you this week, Tara. Sending best wishes! Fingers crossed - so far I've not had bloggy issues. I sometimes think of Blogger as Bugger. Eventually they'll get their stuff sorted out, maybe, we can kinda sorta hope. I hope that your week takes a positive turn, Tara. At least your blog entry went through! Oh, that happened to me last week. It was SO annoying! Hope your week gets better! Nice to know I'm not the only one Blogger hates. Misery and company and all. Everyday I wake up and wonder if it will be the day the internet implodes. I have commented this afternoon, sans problems, and even noticed a few of my error-messaged comments had gone through this morning. I think I posted three comments on someone's blog this morning because it kept giving an error message and I kept retrying. I finally stopped when I realized they might all actually post (eventually) and then I'd look really silly. Ugh, I was so frustrated this morning as I tried to comment on a few blogs... eventually I gave up, went out for the day, came back, and now it's (hopefully) working better. Hope everything's okay in the real world. I'll be thinking of ya. What is it with this week? Wonky is the perfect word to describe it. 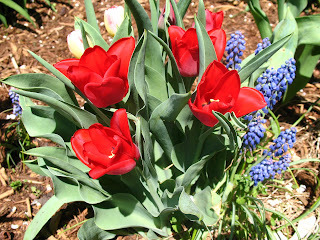 The pretty red tulips made me smile too. Thanks for that! Hope the rest of your week goes well. Good luck. Blogger picks on me sometimes too. Hope things look up for you soon, no matter what arena. Hey girl, I'm just stopping back in to wish you a Happy Weekend (though you may post yet today, with a certain band video, in which case, I'll be back) and show you some love. Have a wonderful weekend Tara. Ugh. I'm sorry about the Blogger problems. But your tulips are beautiful! Thank God for the simple things in life.